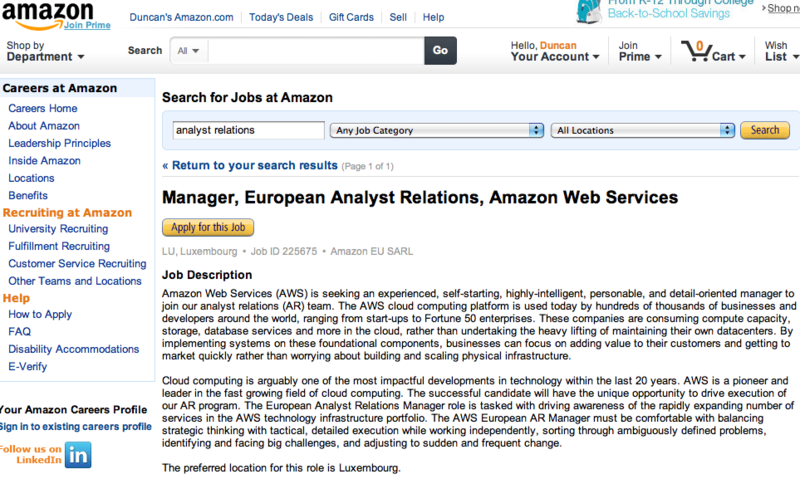 Amazon Web Services is searching for an experienced, self-starting and multilingual AR manager to join its European headquarters in Luxembourg, where its existing AR and PR programme is based. The successful candidate will work in English, with German, French and Spanish also preferred. The role reports to the AWS senior AR manager in Seattle (Steven Armstrong), and interested folk would be well advised to drop Steven a note. The compensation for roles like this tend to vary depending on the experience and ability of the candidate, but this looks like a more senior position on the AWS communications team and we expect the compensation will reflect that reality, especially since there’s no pool of local candidates in the country. Amazon will need someone to drive its European program, lead interactions with analysts, serve as the primary spokesperson with analysts for AWS’s complex offer: with 27+ services and 200+ launches a year. The role is advertised at amazon.com.